Carlos Diego Ferreira was not really on my radar heading into this report. Then the day before the MMA Prospects Report 2013 went live, he scored a decision win over recently released UFC veteran Carlo Prater. As I began to watch what limited video footage was available, it became apparent that Ferreira’s prospect status outweighed those who have now been moved to the Honorable Mentions list. Ferreira was originally born in Manaus, Brazil. In 2009, Ferreira moved stateside, temporarily residing in California, where he began teaching and competing in local BJJ tournaments. Ferreira, who was already a seasoned black belt from his training days at Amazonas BJJ in Brazil, immediately started to make a name for himself by winning multiple BJJ tournaments across the southwest. Carlos, who prefers to be called, “Diego,” eventually transitioned over to MMA in 2010. His official MMA debut, which occurred in California, has still yet to be recorded on Sherdog’s FightFinder. At the time, Ferreira was competing as Carlos Diego, so there are some disputing reports of what his MMA record truly is. Regardless, there is video evidence on YouTube, that he won his first career MMA fight via submission. Also something to note, while living in Brazil, he was competing in BJJ as Carlos Diego Ferreira Neves. In 2011, Ferreira had moved to Texas, where he began competing in some of their local promotions. Ferreira quickly built his record to 6-0 overall, 5 of those wins coming via submission. Ferreira finally got an opportunity to test his skills against a season veteran, Carlos Prater, in the Legacy Fighting Championships promotion. In an unexpected upset, Ferreira was able to continually stifle seasoned UFC veteran and BJJ black belt Carlo Prater, to earn an unanimous decision victory. Ferreira is now the head BJJ instructor at his own facility, Team Ferreira. He also trains out of Silverback Fight club, which is home to recent UFC signee Derrick Lewis. Silverback seems to be a rising gym out of the Texas area, with many of its fighters competing at Legacy FC events. Legacy does have a good relationship with HD Net, so if Ferreira can replicate his recent performances on national television, he will likely find himself on the radar of the UFC or Bellator very soon. Ferreira’s recent wins have made him less of a mystery as far as talent level goes. He has an extremely dangerous submission game. There are multiple videos of his grappling accomplishments online, including footage of him tapping out Heavyweight prospect Jared Rosholt, defeating Jorge “Macaco” Patino, and also going the distance with BJJ phenom Andre Galvao. His striking is still a work in progress. He’s a bit wild and will get in slugging exchanges that he should probably be avoiding. He reminds me a lot of a Diego Brandao when he first came to the states, except that Ferreira is fighting in a suitable weight class while Brandao was not. 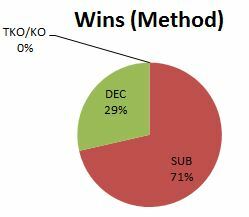 Ferreira does not have Brandao’s KO power, but he has Diego’s intensity and drive to win. Carlo Prater’s UFC tenure did not last long, but make no mistake, Prater has dangerous submission skills. Ferreira not only looked to take Prater to the ground, but he was nearly able to submit him during their fight. Prater has 45 career fights, while Diego had only 6. For Diego to not only hold his own, but basically beat Prater at his own game is very impressive. There is reason for excitement when talking about Carlos Diego Ferreira. For a guy with such little MMA experience, he seems to be a lock for making it to the next level as long as he stays true to his grappling roots.